Moreover not so long time ago everybody was writing their own AJAX library. 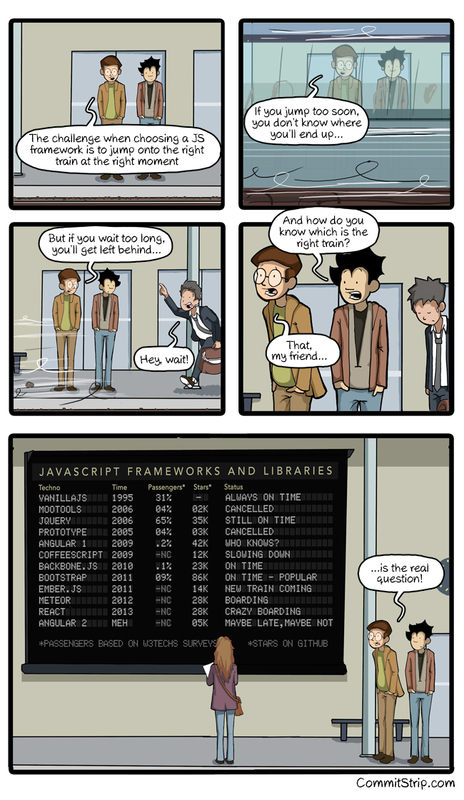 But this changed and now we have a lot of new, shiny frameworks. In my work I am having problems with backbone.js, because we used it in a way which disabled easy upgrade. Of course we can make a big effort and write a big part only to enable upgrade. The question is: what for? React.js now is in a crazy boarding state. And in 2015 everybody must use it. So where is the problem? There is ~40 contributors to this project, but most of them changed few lines. Which means that in this project a "new" design pattern is used: Single Person Responsibility. Similar to Single Principle Responsibility, but with noticeable difference.